At the 2018 Milken Institute Global Forum, Dr. Goodall had the opportunity to participate in a Facebook Live Q&A with Global Wildlife Conservation’s Brian Sheth about Dr. Goodall’s life and career, her reasons for hope and advice for making a difference, especially with young people through the Jane Goodall Institute’s Roots & Shoots program. Jane and Brian had a great conversation which you can watch above. Below you will find several of our favorite quotes from their discussion. 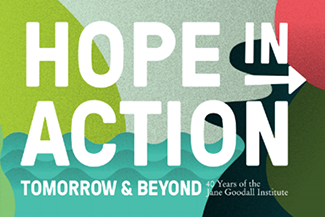 Through the generosity of Brian and Adria Sheth and the Sheth Sangreal Foundation, all gifts to the Jane Goodall Institute until June 30th will be matched. Double your impact today. In responding to a question about how Jane manages to remain as active as she is, Jane shared her grandmother’s favorite passage from the Bible, “As your days, so shall your strength be.” This to Jane just means to take a day at a time. You can get through one day, rest in between and when each new day comes you will have renewed strength and ability to take on its challenges. To answer how Jane became the world’s foremost chimpanzee expert and worldwide force for conservation, Jane credits her always supportive mother with the advice that to achieve her dreams she must, “Work hard, take advantage of opportunities and never give up.” This is the advice that Jane says guided her in her career and is advice she shares as she speaks with audiences around the world. Though Jane may have appeared to have no fear in approaching her work studying the chimpanzees of Gombe National Park, she remarked that she did have “some fear” and found this important to help her react to the wildlife and other situations she would inevitably encounter in the forest. Despite this fear, however, she remarked that her sense of purpose was so strong that she could overcome the fear to get her work done. These and more great comments were made in Dr. Goodall and Brian Sheth’s conversation at the 2018 Milken Institute Global Forum. Watch their conversation above and add your own comments to the discussion section below!